Well-born, handsome and educated, Columbanus was torn between a desire for God and easy access to the pleasures of the world. Acting on advice of a holy anchoress, he decided to withdraw from the world. His family opposed the choice, his mother going so far as to block the door. Monk at Lough Erne. He studied Scripture extensively, and wrote a commentary on the Psalms. Monk at Bangor under abbot Saint Comgall. In middle age, Columbanus felt a call to missionary life. With twelve companions (Saint Attala, Columbanus the Younger, Cummain, Domgal, Eogain, Eunan, Saint Gall, Gurgano, Libran, Lua, Sigisbert and Waldoleno) he travelled to Scotland, England, and then to France in 585. The area, though nominally Christian, had fallen far from the faith, but were ready for missionaries, and they had some success. They were warmly greeted at the court of Gontram, and king of Burgundy invited the band to stay. They chose the half-ruined Roman fortress of Annegray in the Vosges Mountains for their new home with Columbanus as their abbot. The simple lives and obvious holiness of the group drew disciples to join them, and the sick to be healed by their prayers. Columbanus, to find solitude for prayer, often lived for long periods in a cave seven miles from the monastery, using a messenger to stay in touch with his brothers. When the number of new monks over-crowded the old fortress, King Gontram gave them the old castle of Luxeuil to found a new house in 590. Soon after, a third house was founded at Fontaines. Columbanus served as master of them all, and wrote a Rule for them; it incorporated many Celtic practices, was approved by the Council of Macon in 627, but was superseded by the Benedictine. Problems arose early in the 7th century. Many Frankish bishops objected to a foreign missionary with so much influence, to the Celtic practices he brought, especially those related to Easter, and his independence from them. In 602 he was summoned to appear before them for judgment; instead of appearing, he sent a letter advising them to hold more synods, and to concern themselves with more important things than which rite he used to celebrate Easter. 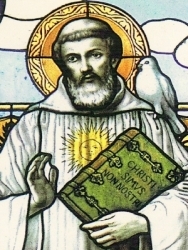 The dispute over Easter continued to years, with Columbanus appealing to multiple popes for help, but was only settled with Columbanus abandoned the Celtic calender when he moved to Italy. In addition to his problems with the bishops, Columbanus spoke out against vice and corruption in the royal household and court, which was in the midst of a series of complex power grabs. Brunehault stirred up the bishops and nobilty against the abbot; Thierry ordered him to conform to the local ways, and shut up. Columbanus refused, and was briefly imprisoned at Besançon, but he escaped and returned to Luxeuil. Thierry and Brunehault sent an armed force to force him and his foreign monks back to Ireland. As soon as his ship set sail, a storm drove them back to shore; the captain took it as a sign, and set the monks free. They made their way to King Clothaire at Soissons, Neustria and then the court of King Theodebert of Austrasia in 611. He travelled to Metz, France, then Mainz, Germany, Suevi, Alamanni, and finally Lake Zurich. Their evangelization work there was unsuccessful, and the group passed on to Arbon, then Bregenz, and then Lake Constance. Saint Gall, who knew the local language best, took the lead in this region; many were converted to the faith, and the group founded a new monastery as their home and base. However, a year later political upheaval caused Columbanus to cross the Alps into Italy, arriving in Milan in 612. The Christian royal family treated him well, and he preached and wrote against Arianism and Nestorianism. In gratitude, the Lombard king gave him a tract of land call Bobbio between Milan and Genoa in Italy. There he rebuilt a half-ruined church of Saint Peter, and around it he founded an abbey that was to be the source for evangelization throughout northern Italy for centuries to come. Columbanus always enjoyed being in the forests and caves, and as he walked through the woods, birds and squirrels would ride on his shoulders. Toward the end of his life came word that his old enemies were dead, and his brothers wanted him to come back north, but he declined. Knowing that his time was almost done, he retired to a cave for solitude, and died as he had predicted. His influence continued for centuries as those he converted handed on the faith, the brothers he taught evanglized untold numbers more, and his brother monks founded over one hundred monasteries to protect learning and spread the faith. Convert, brought to Christianity either by Saint Peter or by Saint Paul. One of the Seventy Apostles. Consecrated as a bishop by Saint Peter the Apostle. Mentioned in Philippians 4:3. Fourth Pope. Apostolic Father. The Basilica of Saint Clement in Rome, Italy, one of the earliest parish churches in the city, is probably built on the site of Clement's home. Author of the Epistle to the Corinthians. His name occurs in the Canon of the Mass. Origen and Saint Jerome identify him as working with Saint Paul the Apostle. Martyred in the persecutions of Trajan. Son of a mining engineer. From childhood he was known for high spirits and cheerfulness, and he grew up in a pious home. Born to privilege, he had great affinity for the poor and working classes. Victim of recurring stomach disorder. Jesuit novice at 20. Exiled during the Mexican Revolution, he continued his studies abroad. Ordained in Belgium in 1925 at age 36, he returned to Mexico in 1926, a time when churches were closed, priests were in hiding, and persecution of the Church was government policy. Father Miguel used disguises to conduct an underground ministry, bringing the comfort of charity and the sacraments to the covert faithful. Falsely accused in 1927 of a bombing attempt, Pro became a wanted man, was betrayed to the police, and without trial, he was sentenced to death. The photograph on this page was taken the day of his martyrdom. As he was about to be shot, he forgave his executioners, refused a blindfold, and died shouting "Long live Christ the King!" The government prohibited a public funeral, but the faithful lined the streets when his body passed. From childhood Enrichetta felt a call to religious life, and joined the Sisters of Charity of Saint Joan Antida Thouret on 20 December 1911. She worked as a kindergarten teacher in Vercelli, Italy, but was forced to quit when she developed Pott's disease, a form of tuberculosis of the spine, in 1917. On 25 February 1923 she was miraculously cured by a pilgrimage to Lourdes, France through the intercession of Mary Immaculate. She recovered so completely that on 24 May 1923 Sisters Maria Angela was assigned to prison ministry at San Vittore Prison in Milan, Italy. Her work with the prisoners was a great success, and she became known as the Mother and Angel of San Vittore, and was named the superior of the Sisters there in 1939. She was there when it became an SS headquarters and prison for Jews, priests, nuns and resistance workers who were fighting the Axis powers of World War II. She and the Sisters helped them by smuggling in supplies, smuggling out messages and working with Church authorities to intervene for the prisoners, saving many in the process. On 23 September 1944 a message from a prisoner was intercepted that was director to Enrichetta, and she was arrested for spying and sentenced to death or imprisonment in Germany. Church officials, including Blessed Alfredo Ildefonso Schuster, Archbishop of Milan, intervened for her, and she was transferred to the Sisters' house in Brescia, Italy where she wrote a memoir of her imprisonment. On 7 May 1945, at the end of the war, she was re-assigned to the San Vittore where she administered to prisoners of war - including the former jailers. Born to the nobility, daughter of Amadeo of Savoy, Lord of Piedmont and titular Prince of Achaea, and Catherine of Geneva. Married to Theodore Paleologus, marquis of Montferrat on 17 January 1403. Widowed in 1418. Declined a marriage offer from Philip, Visconti of Milan. Influenced by Saint Vincent Ferrer, she became a Dominican tertiary. In 1426 she founded a house at Alba, Liguria and served as its Prioress. In 1451, 25 years later, she received papal approval for the congregation from Pope Eugene IV. She was subject to visions and ecstasies, and was a reputed miracle worker. Her later years were spent under a cloud of controversy as her house faced false charges of doctrinal irregularities, and she charges of being overly strict with her nuns. Rich, noble widow. Mother of seven sons, all of whom were martyred - Alexander, Vitalis, Martial, Januarius, Felix, Philip and Silvanus. Felicity was devoted to charity and caring for the poor. She was arrested for her faith and ordered to worship pagan gods; she refused. Her sons were arrested and given the same order; they refused. After a series of appeals, all of which were turned down, they were all ordered executed by emperor Antoninus. Felicity was forced to watch as her children were murdered one by one; after each one she was given the chance to denouce her faith. Martyr. Son of Blessed Adela. Related to the dukes of Austrasia. Benedictine monk under Saint Remaclus. Studied at the cathedral at Metz, France. Ordained by Saint Clodulf of Metz. Noted preacher. Built a church on the land around his family's home c.656, and had it blessed by Saint Theodard of Liege in the names of Saint Quintinus and Saint Remigius of Rheims. Evangelized the throughout the area of Hasbein, and as the converts grew he was forced to build a monastery which was later named for him. Founded a convent near Bruges, Belgium c.660. The assorted movements of his relics have led to several local lists having different dates for his memorial. Bishop of Metz, France; tradition says he was sent there as a missionary by Saint Peter the Apostle. Legend says that when Clement arrived in Metz, the area was besieged by the Graoully, a large, poison-breathed serpent that lived in a local Roman amphitheatre with an army of snakes. Clement chased away the snakes and banished the Graoully by making the Sign of the Cross at them. This led to the conversion of the whole town. Cousin and friend of Saint Gregory Nazianus; close friend of Saint Basil the Great. Studied law and rhetoric in Constantinople, and taught rhetoic there. Bishop of Iconium (modern Konya, Turkey) in 374. Fought against heresies of Arianism, the Manichaeans and the Messalians. Attended the Council of Constantinople in 381. Presided over the synod in Sida, Pamphylia in 394. He wrote poetry in classical Greek, and his letters to Gregory and Basil have survived to today. Monk and then abbot of the monastery of Saint Tudwals of Tréguier in Brittany (in modern France) c.528 to c.564 from where he evangalized the region. Grand Duke of Novgorod and Kiev. He defeated the Swedes in battle on the River Neva; from that he derived his surname of Newski (Nevski). Defended his land against invading Tatars. Confessor of the faith. 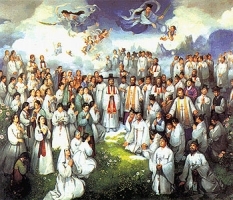 Married lay woman in the apostolic vicariate of Korea. Mother of Saint Paul Chong Hasang and Saint Jung Hye. Martyr. Pilgrim from Limoges, France to Jerusalem. Monk at Issoudun, France. Hermit at Chabris, France. Born to the nobility. Premonstratensian canon. Canon of the Premonstratensian monastery in Ratzeburg (in modern Germany). Bishop of Ratzeburg. Lived as a simple friar, but was known for his charity. Member of the Visitation Nuns. Martyred in the Spanish Civil War. Bishop of Girgenti, Italy. Wrote a commentary on the book of Ecclesiastes, which has survived, and was a noted Bible teacher, explaining the Scriptures in a plain way to plain people. Benedictine monk at Cassoria, Abruzzi, Italy. Worked for a while with Saint Guy of Casauria. Retired to live as a hermit on Mount Caramanico where he eventually founded the abbey of Saint Nicholas. Cousin of Emperor Claudius. Martyred with Saint Irenaeus of Chiusi for ministering to Christian prisoners, and burying martyrs. Spiritual student of Saint Illtyd. Monk. Founded the monastery of Whitland in Wales and served as its abbot. 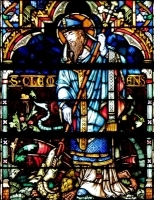 Spritual teacher of Saint David of Wales and Saint Teilo of Llandaff. Benedictine anchoress who lived walled up in a cell near Saint Wiborada, under obedience to the abbot of Saint Gall in Switzerland. Bishop. 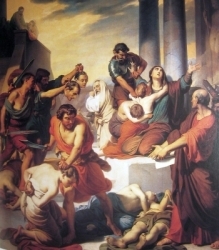 Tortured and martyred in the persecutions of Diocletian. Consecrated virgin. Martyred in a period of imperial Roman persecution. 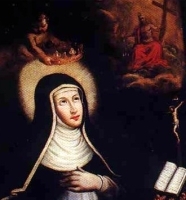 Niece of Saint Gertrude of Nivelles. Abbess of the abbey in Nivelles, Belgium. Fled into the mountains for a period to escape the persecutions of Diocletian. Bishop of Fano, Italy. Sixth-century hermit who lived in a cell in Paris, France. Benedictine monk at Farfa. Abbot of Casauria, Italy.